You can rest assured that your company-branded sticky pad will be kept on and readily used by your clients or prospective clients. 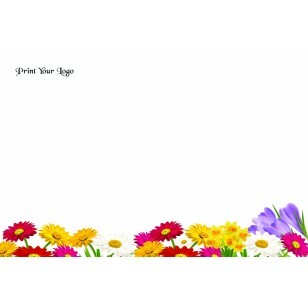 The landscape style of this 150 mm x 100 mm white sticky note pad is ideal for creating sticky business cards. You simply print a replica of your business card directly on the sticky note pad to create a business card that will stand out from the rest. Imagine meeting with a prospective client who asks for a business card. Instead of the typical card, you deliver your contact information via sticky note pad. Unlike standard business cards that become accidentally tossed aside or lost, your sticky business card can adhere to a laptop, computer monitor, or telephone as a friendly reminder to call you back. Also available with a Portrait Orientation too. Please ask tell our friendly team when you make your enquiry. The sticky note pad contains 40 sheets of white paper with each page adorned with the branding of your choosing. It also contains a backing paper as the last page and an adhesive that can be positioned on any one side of the sticky note pad. The products clean-white paper can be customized with any full-colour image to make a visual impact. We do, however, recommend that the imprint area be no larger than 50% of the page size so that there is maximum writing space for the end-user. Price includes the cost of the full-colour print image or wording, but does not include GST. Printing is done in Australia and product(s) can only be delivered to customers within Australia.